Not Just Any Old Day jewelry. Photos courtesy of Not Just Any Old Day, LLC. This post is sponsored by Not Just Any Old Day. In need of a timeless piece of statement jewelry to commemorate special dates and occasions? Then, our product review of Not Just Any Old Day jewelry is perfect for you! This line of customized jewelry is a great way to eternalize significant moments and milestones, and it’s a lovely gift to give to the special people in your life. Not Just Any Old Day jewelry pieces are one-of-a-kind keepsakes that can be cherished for a lifetime. They’re an eye-catching and unique way to keep a special day, like an anniversary or birthday, close to your heart at all times. Each Datesake piece is inscribed with a signature calendar featuring a Swarovski crystal as a mark on the date. Loved by celebrities and fashionistas, the calendar Datesake collection is handcrafted from recycled lead-free pewter in the USA. Other top picks of Not Just Any Old Day are the Key To My Heart Key Calendar Necklace with Swarovski Crystal, the just-released “Your Special Day” Mini Calendar Charm Expandable Bangle Bracelet, and the “Your Special Day” Key Calendar Necklace. Notable celebrity fans include Kym Whitley, Kelly Preston, Janina Gavankar, Carolyn Hennesy, Jason George, Tracey Heggins, Scott and Renee Baio, Marilu Henner, Antonio Sabato, Jr., and Courteney Cox. It’s easy to see why stars are going gaga for Not Just Any Old Day: Their pieces are all about being sentimental in style! 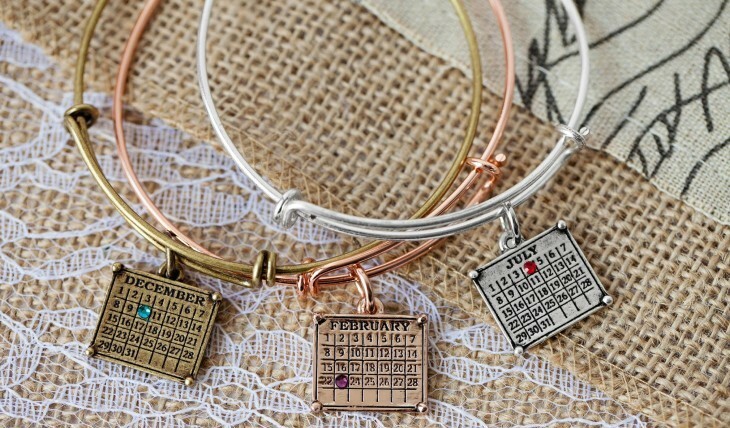 The elegant and chic calendar charms are statement pieces that can be worn all year long. If you enjoy being up-to-date on the latest celebrity fashion trends, adding these Datesakes to your list of jewelry splurges is a must. Be prepared to have others fawn over and ask where you got your beautiful calendar charm and what the meaning behind your Datesake is! To learn more about the company or how to purchase Datesake jewelry from Not Just Any Old Day, visit NotJustAnyOldDay.com.